Maybe prover-intention is the most important, it is an active conscious choice, it embodies focus, receptive attention, but also conscious surrender (love?) to the proving substance intending to bring unconscious energypatterns into consciousness (without any skepticism or limiting beliefs). I can imagine that it will enhance prover-sensitivity and attention and maybe even the remedy-energy. Jan, I really appreciated this article and its comments. Maybe channeling remedies can also be seen as a kind of proving (C4 triturations of JÃƒÂ¼rgen Becker with Witold Ehrler as medium and in the past the group around Martin Miles did remedy channeling). In this way often the more transcendental aspects of the remedy are highlighted. Like Lou says the Ã¢â‚¬Å“daily lifeÃ¢â‚¬Â proving symptoms are very important but it is a misconception that with a meditation- or a dreamproving there will be no Ã¢â‚¬Å“daily lifeÃ¢â‚¬Â provingsymptoms the only thing is that prover-attention is already dissipated during daily life and symptoms are not observed/reported anymore. For me the ideal mix is a seminarproving (at least 2-3 day seminar) - you can have a meditationproving, a dreamproving and a (short) daily life proving (with desires/aversions; physical symptoms; social interactions etc). It is fun and doesn't have to take too much time. You have a strong point about "daily life" proving symptoms. Meditation and dream provings need more interpretation. I forgot to mention trituration provings. I agree they are mostly very good and even the best provings. I have also experienced the effect of proving symptoms before the proving. The phenomenon definitely exists. Identifying sensitive indivuals for provings would be a worthwhile. A problem can be that some individuals will be sensitive to certain (groups of) remedies and less to others. There are always definite and reliable physical symptoms. Although a group of people gathered together under such conditions are subject to suggestion it is just this " collecting dish " of group energy which focuses the attention and allows for the appearance of strong symptoms on all levels. There is so much that can be said about proving methodolgy and it is clear that this comment section is not the right place. I would, however, like to add one observation which has been of great interest to me and that is the factor of time and prover sensitivity. I have seen clearly and experimentally demonstrated on a number of occasions that those who are really sensitive experience proving symptoms sometimes days and frequently hours before the proving begins - that is long before they are in the presence of the substance to be proven. One aspect of this phenomenon is that it can be used to identify those individuals who are most likely to produce ' core ' symptoms. I have experimented with this method over the past 10 years and have found it to be both time efficient, effective and fascinating. In its simplest format it requires that a group of people meet on one evening for 3 -4 hours and then return some 10 days later for a final meeting. From the point of view of physical indications of the remedy, a dream or meditation brings out nothing of this. Not even general physical indications. Although not ideal, I have had cases where a small physical symptom, especially with modality, helps in the selection of the remedy. Many times these types of symptoms are generated in provings. As well, knowing even just the general area of the body and organs that a remedy and its larger family classification can help is very useful. I do believe that all types of provings are beneficial. Having intitiated and supervised both meditation and full provings, my suggestion would be that we make an effort such that for each plant family or even periodic table stage or group of remedies to have one full proving. Then other meditation or dream provings of other remedies within that family or group can add to our understanding of both the group as well as the specific remedies being proven. In a full proving, the prover while under the energetic influence of the remedy, asserts, reacts, responds in daily situations that bring out the symptoms in a more definable way. This develops mind symptoms that are immediately highly useable and understandable, unique and require little interpretation. In meditation provings and dream provings much interpretation is needed. It is difficult for the proving symptoms to stand alone. You almost need some understanding of the substance to clarify the somewhat ephemeral nature of the symptoms generated. In the full proving, because much of the symptoms generated are within the context of daily life, they require little or no interpretation- you can get a direct experience of the remedy and the remedy symptoms. Thank you, Jan, for a very good analysis of provings and classifying how proving information is generated. 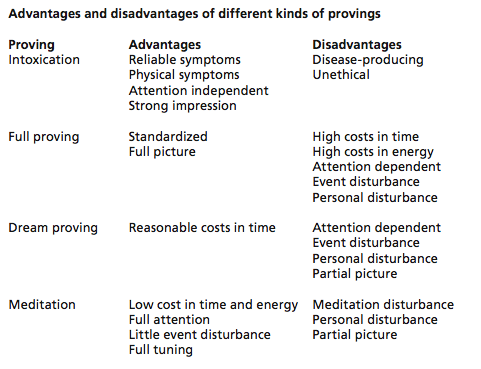 What the final chart of types of provings lacks is one very key factor (advantage/disadvantage) for evaluating the benefits of various types of provings. This key factor is having proving symptoms that are generated in the midst of daily life. This factor really only results from the full proving. The advantage of this is that the prover, by going about their daily life and therefore experiencing the influence of the remedy in different situations can report changes of state that are provoked in daily life.